Hey there, I hope you had a good weekend. We spent ours doing a few small projects in the kitchen and cleaning up some of the construction mess that we’ve made over the past year. Because of the reno, I’m a little behind on my Christmas posts but I hope to make it up to you this week with some fun stuff. 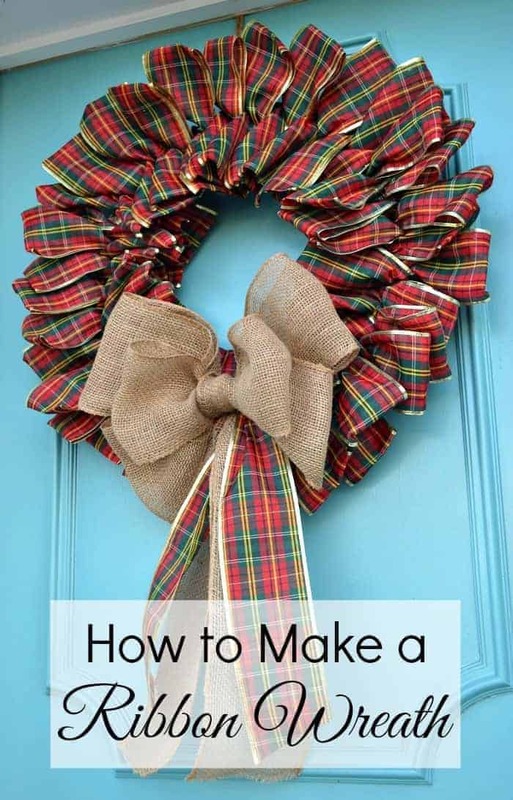 Besides working on the kitchen, I’ve been busy making several fun holiday crafts (hey a girl’s gotta have fun sometimes 😉 ) and today I’m sharing how I made the ribbon wreath that’s on our front door, you may have seen it when I shared my Christmas living room last week. *Fair warning, this is a picture heavy post. I’ve been using a hanging basket on my front door for the past few seasons but I was ready for a change so I came up with this fun idea. 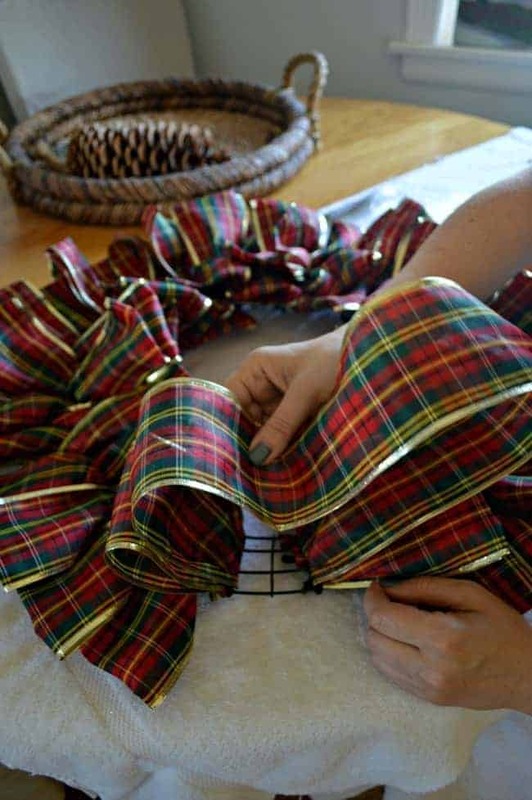 Of course it had to involve plaid ribbon and burlap because I’ve been crazy over both of them lately, but it was an easy project to do and cost less than $15 for all of the supplies, which is a lot less than it would have been if I bought it ready-made. 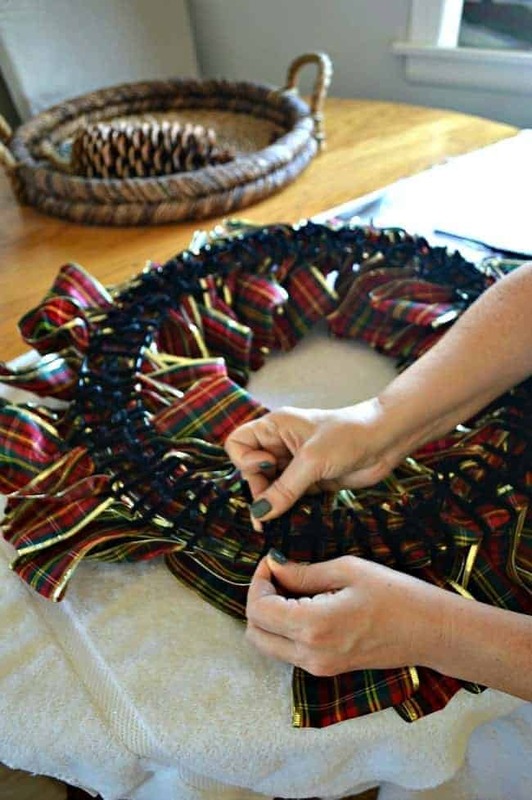 A little disclaimer here…I needed the hubs to help me with pictures (if you’ve been here before you know that he hates to touch my camera) and he agreed, after finished it, so I had to take a small section of the completed wreath apart to show you how I made it. I worked my way around the whole frame making a loop and tying each one down with a pipe cleaner. As I worked my way around, I made sure I kept the loops at the same height and tied them close together (otherwise you can see the wire frame when you twist the loops). Once I was done making all the loops, it was time for some pulling action. I grabbed a loop and pulled it to the inside of the frame. Then I took the next loop and pulled it the opposite way, to the outside of the frame. I worked my way around the frame pulling each loop one way or the other. After I was done pulling all the loops, I went back and checked my work, making sure I didn’t have any of the frame showing and fixing any funky looking loops. 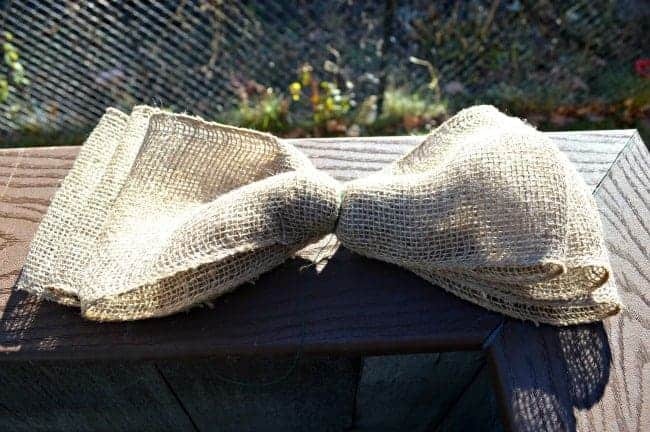 All that was left to do was to add a burlap bow, that I quickly made. 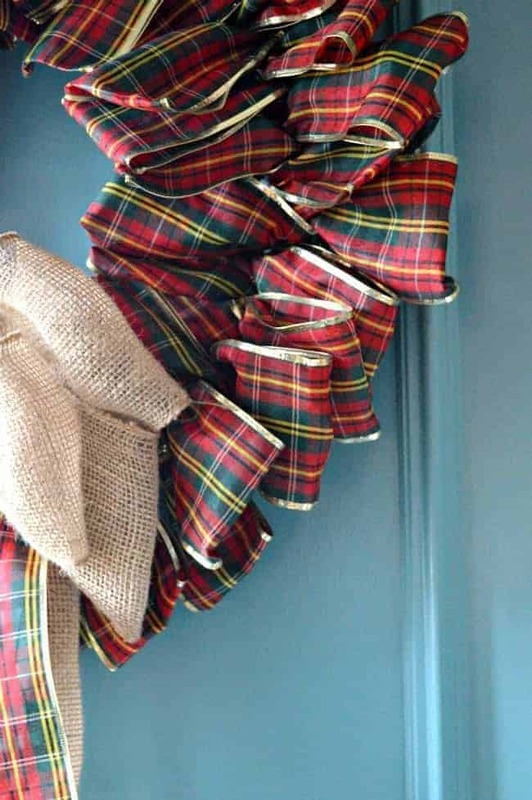 I pinned a piece of the plaid ribbon to the burlap bow tails just for fun. 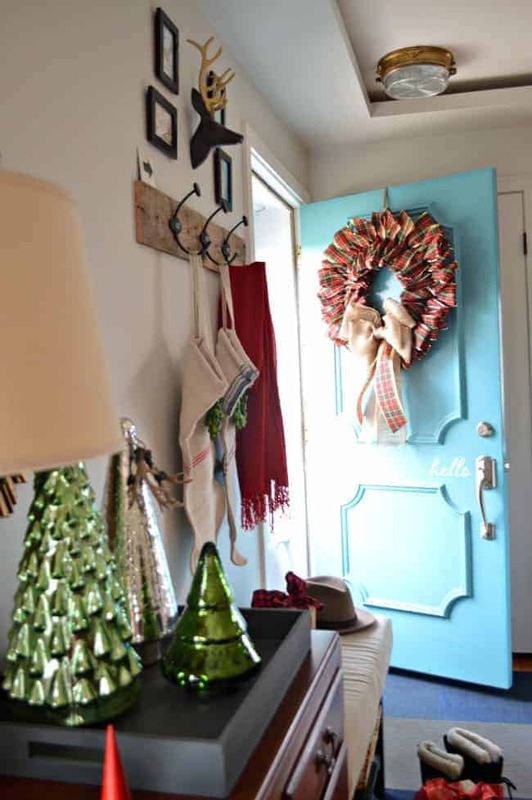 I hung it on my turquoise front door with heavy twine and called it done! I had no real plan when I started this project, just made it up as I went along, and I love how it turned out. Do you ever wing it when you start a project or do you need a solid plan? 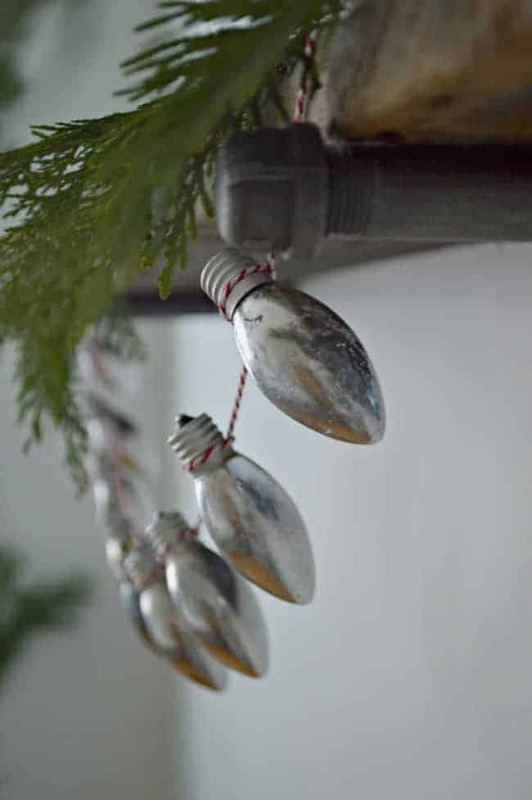 Check out my favorite Christmas craft…made from light bulbs. I feel like the projects that I have planned out, step by step, never come out like I want so I just try to go in with some kind of idea and take my chances. 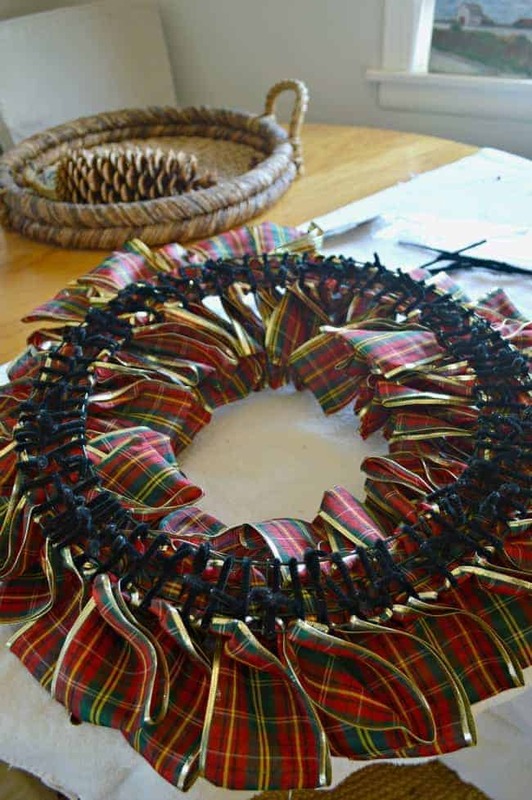 This wreath didn’t turn out the way I thought it would but I love the results. Thanks so much for all of your kind words today Nancy! What a great project, Kristi! It looks professionally done. Crossing my fingers that you get your kitchen done soon. It looks great so far. 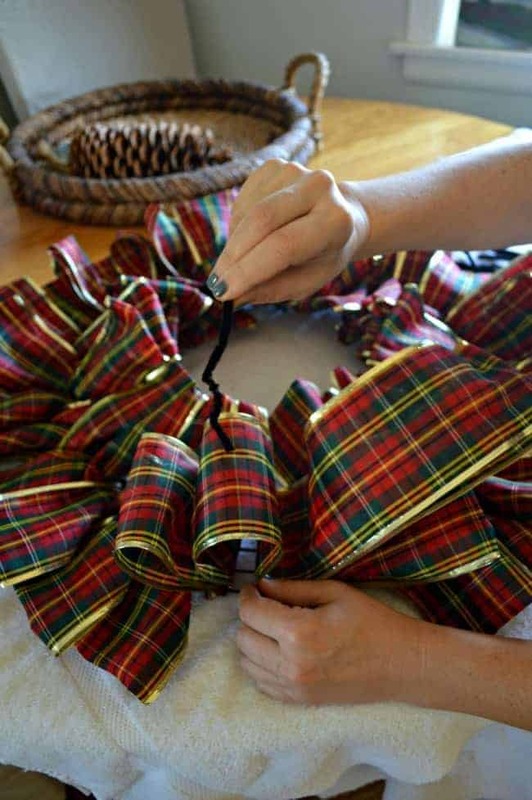 Oh my how I love your ribbon wreath! 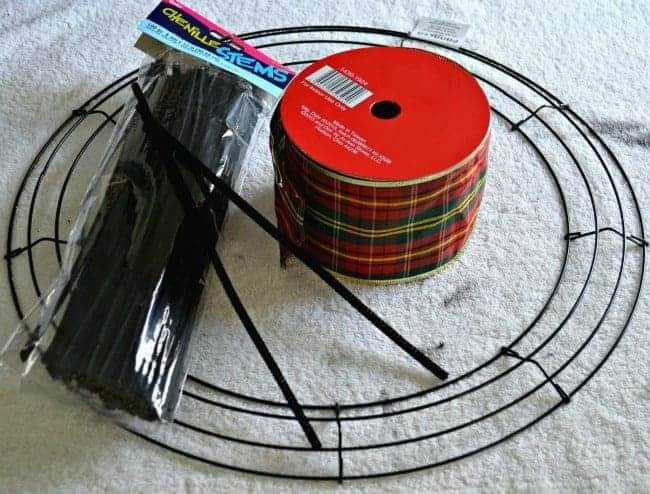 I’ve been meaning to make a Christmas wreath this year but still have not got round to do it. Thank you for sharing this one, with such clear instructions! Maybe now I’ll finally manage to do it! 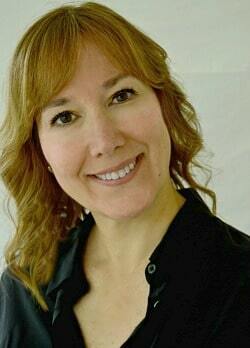 Thanks so much Teresa, it was such a fun and easy project. Thanks you too for the invite to your link party, I’ll stop by and check it out you. Thanks so much Kim. It really was super easy to do. Thanks for the nail love too. 😉 I got them done for our cruise in September and I’ve been hooked ever since. Have a great week my friend. 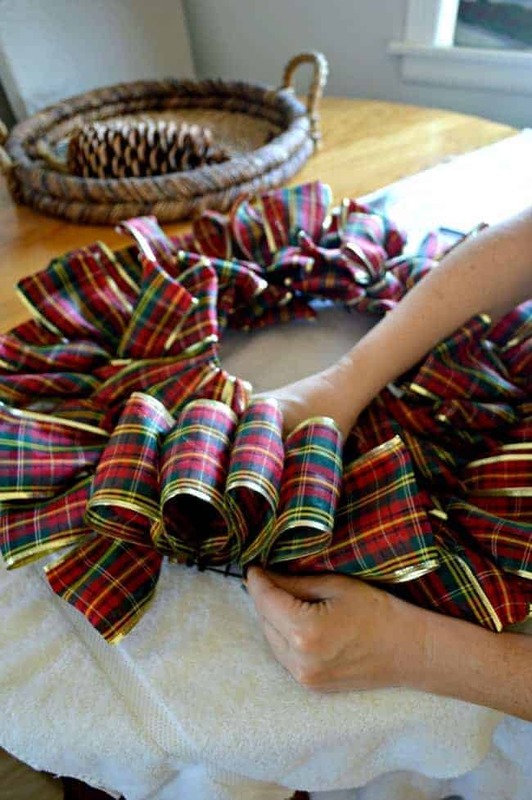 So creative!~ I need to try that for next year! Thank you Kristi, it’s beautiful! Yay for more plaid! 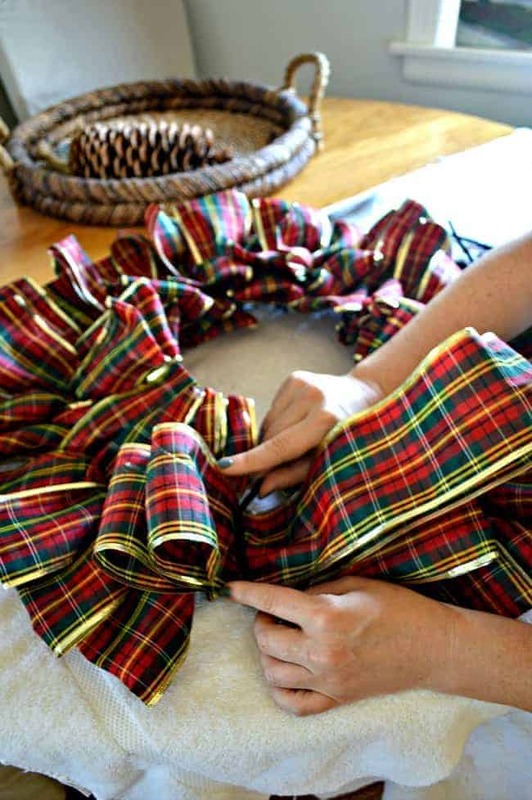 I like plaid all year ’round, so am so pleased when it’s acceptable more so at Christmas time – because then, well, there’s more of it about! 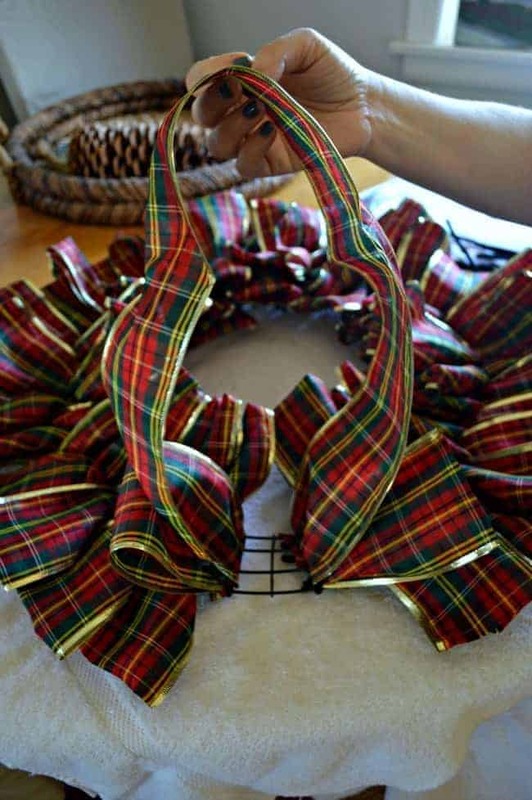 The pipe cleaners were really easy to use and, with all the colors out there, you can pick one to match the ribbon. 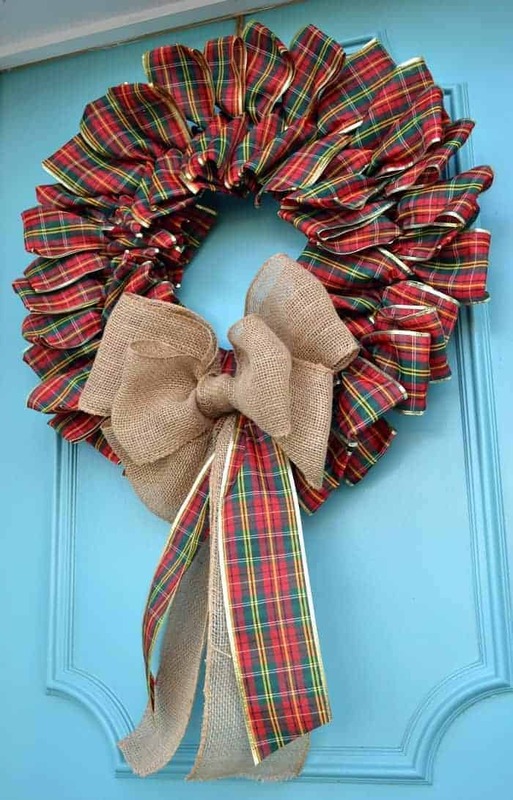 Thanks so much for visiting with me and my plaid wreath. Have a great week! Thanks Debbie, it was really easy. Thank you too for your nice comments on my Christmas living room. I can’t tell you how much I appreciate your support. 🙂 Happy week to you! Looks easy enough. 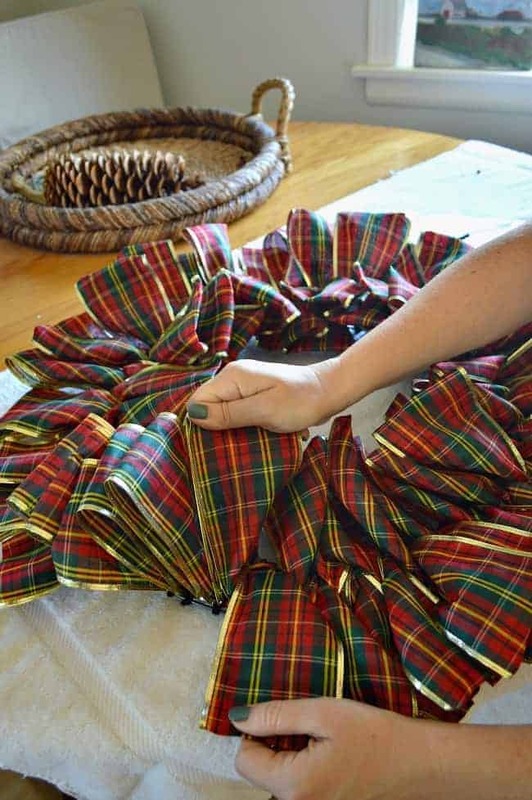 I have odds and ends of “every day” ribbon and a smaller wreath. 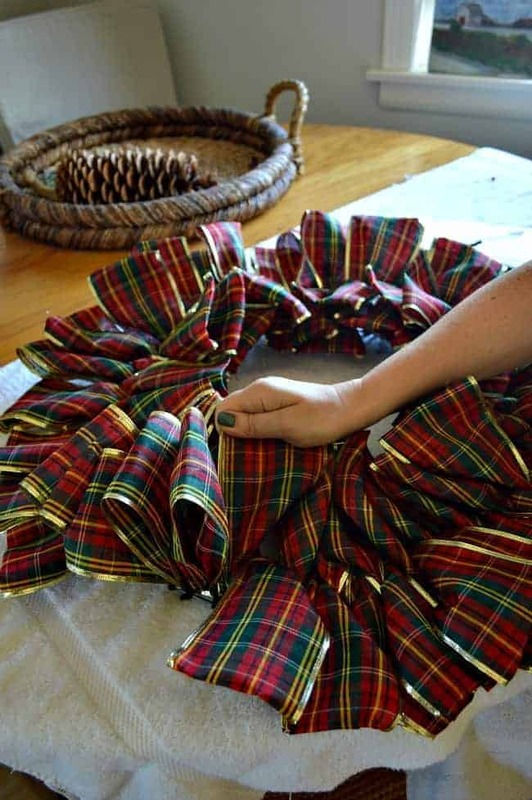 Going to see what I can come up with for after December wreath. Thanks.